Just a quick post - I realize it has been a while! 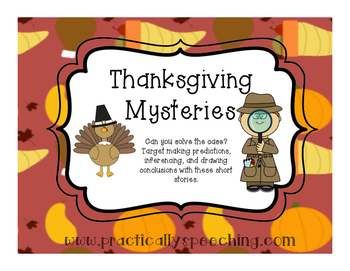 I love using mysteries to target inferencing, making predictions, and drawing conclusions. With Thanksgiving around the corner, I thought it would be fun to solve some turkey trouble! I created a packet with 6 different short stories that contain a graphic organizer on the same page. This will make it easier to teach note-taking skills and allow students to look back at the story without having to flip pages! You can preview the entire packet on TpT by clicking the link found HERE!